Charles Fourier, a 19th-century French philosopher, was a visionary’s visionary. If society adopted his version of utopian socialism, humanity, he promised, would be transformed — and so would the natural world. In the coming era of Perfect Harmony, six moons would circle the planet. The North Pole would become warmer than the Mediterranean. Even better, all the oceans would turn to lemonade. Perfect harmony remains elusive. But the poles are indeed warming up, and the chemistry of the seas is changing, although the lemonade threshold is a ways off. The process is called ocean acidification (OA for short), a term coined by scientists around 1999. What’s driving it is the ability of the oceans to soak up carbon dioxide like a giant sponge. The seas have absorbed about a third of the CO2 produced by all human activities, from the first brush fires set by hunter-gatherers on through modern exhaust-pipe and smokestack emissions. That’s been important in mitigating the greenhouse effect responsible for global warming. But there’s a cost. That influx of CO2 is changing the chemical composition of seawater, making it more acidic and, among other impacts, more difficult for many marine organisms — mollusks, corals, sea urchins — to build their shells. While we’ve heard about coral reefs in tropical seas dying out, less well-publicized changes are taking place here along the California coast, where the prevailing winds and currents actually increase the acidity of the water. But now a consortium of scientists up and down the Pacific coast has formed to get a handle on the problem. When I was a kid, I had an aquarium whose inmates were mostly New World tropical fish: guppies, tetras, angelfish. These exiles from the Amazon needed acidic water to feel at home. That, long before I even saw a Bunsen burner or the periodic table, is how I learned about pH. The pH (“power of hydrogen”) scale reflects the concentration of hydrogen ions in a solution. Distilled water has a “neutral” pH of seven. A lower-pH solution is acidic; higher, alkaline. Fourier’s lemonade is about 2 or 3. Like the Richter earthquake scale, it’s logarithmic: a one-unit decrease in the number shows a tenfold increase in acidity. Seawater has historically been alkaline, but is increasingly becoming less so. Near-surface marine pH is currently about 8.1, 30 percent more acidic than before the Industrial Revolution. It’s projected to drop to 7.8 by 2100, a 150 percent increase in acidity in three centuries. The greater the acidity, the lower the carbonate ion concentration, which makes it harder for marine organisms to convert the calcium carbonate in seawater into mineralized calcite or aragonite, the stuff of their shells. What does this mean for the ocean ecosystem in general? And along the California coast in particular? We’re just beginning to figure that out. First of all, we need to understand that ocean pH isn’t uniform. Deep water is naturally lower in pH than shallower coastal waters, in part because of all the deep-sea creatures breathing out CO2. That’s been amplified by atmospheric CO2 entering the ocean. Here on the California coast, deep water rises to replace surface water driven offshore by seasonal winds. Ironically, the upwelling that fuels the biological bounty of the California Current brings acidified water toward the surface. Recent computer models predict that conditions here will reach a critical point for shell formation in mollusks and other marine creatures by 2050. In previous experiments, California mussels exposed to high CO2 concentrations developed smaller, thinner, weaker shells, making them more vulnerable to predators. Unlike oysters and mussels, sea urchins don’t appear to be suffering similar impacts, even though they also use calcium carbonate — combined with a layer of organic material — to make up their shells. “We saw no dramatic morphological difference in urchins raised under higher CO2 concentrations,” Hill says. Why not? According to Hill, the answer likely resides in the genes. 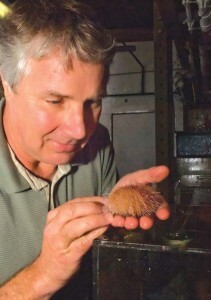 In a recent article in the journal Evolution, Stanford post-doc Melissa Pespeni described changes in the genes governing biomineralization and metabolism — the processes responsible for the formation of the urchins’ shells — that occurred over the course of an experiment at Hill’s lab. “We found the urchins have ‘lucky genes,’” coauthor Steve Palumbi, also at Stanford, told an NPR reporter. Think of genes as a tool kit: “If you happen to have bad plumbing, you’ll have more plumbing tools in your house.” The urchin’s kit, evolved in an environment where upwelling can suddenly lower pH, may serve it well in acidified future seas. Other calcifiers, without the urchin’s natural genetic variability, high fecundity, and strong potential for dispersal, may be less fortunate. The Bodega experiments and studies elsewhere suggest that OA won’t be bad news for all creatures. “Lobsters and crabs don’t appear to be negatively affected at all,” says Hill. Their shells have an epicuticle, a thick external organic layer that prevents direct contact with seawater. So some popular restaurant menu items might be safe for now. But on balance, the losers may outnumber the winners. Barnacles, quite common along the California coast, have calcium-carbonate-based shells and show effects similar to those in oysters and mussels. Two recent comparisons of more than 100 published studies covering most marine plant and animal groups reached similar conclusions: Overall, shell-forming and survival are compromised, especially with the combination of OA and warmer temperatures. We humans might not miss the barnacles right away, although shorebirds like oystercatchers and turnstones certainly would. But the threat to commercially farmed mollusks — oysters, mussels, clams — is raising alarms. Oyster-growing alone is a $110 million business on the Pacific Coast, with annual revenues in California reaching $12 million in 2005. Five years ago, the Whiskey Creek Shellfish Hatchery at Netarts Bay on the Oregon coast suffered a mass die-off of larval oysters. The owners suspected disease, but water samples turned out to be pathogen-free. Oregon State University biogeochemist Burke Hales, who coauthored a 2012 report on the oyster die-off, identified low-pH seawater as the culprit. The Taylor Shellfish Hatchery in Washington State experienced similar mortality. In an article published this summer, Hales’ colleague George Waldbusser explains the vulnerability of oysters at this stage in terms of energy budgets: living off their yolks, the tiny creatures succumb to the stress of the shell-forming effort when exposed to low-pH seawater. 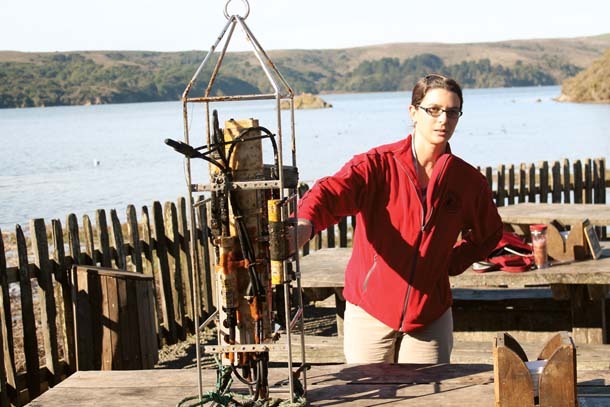 Geologist Tessa Hill of UC Davis holds a sensor that monitors ocean pH in Tomales Bay. 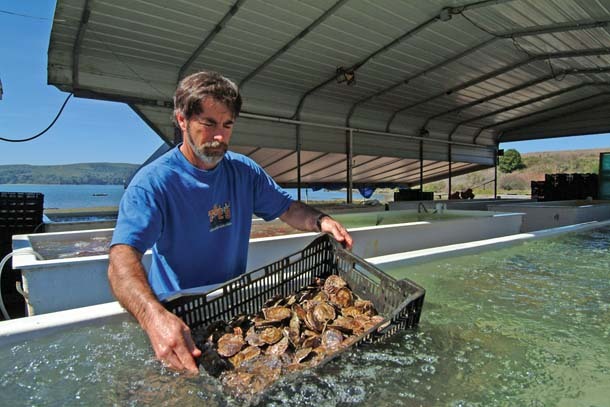 Hill has partnered with Hog Island Oyster Company on Tomales Bay to study the impact of ocean acidification on oysters. Photo by Brenna Schlagenhauf, Hog Island Oyster Co.
Estuaries are dynamic environments, and OA is complicated in places like Tomales Bay. “In winter you have nutrient loading, rainfall, and runoff,” Sawyer adds. Hill elaborates: “Fresh water flowing across the local bedrock — volcanic and sedimentary material — is low in pH. Seasonally, estuaries see big bursts of low-pH water from rivers and streams. It’s also low in calcium carbonate ions.” To compound the situation, upwelled seawater, with its lower pH, moves in and out of the bay. Superimposed on those seasonal fluxes are daily cycles, driven by the respiration of aquatic creatures. “By nightfall, you get a big buildup of respired carbon and a drop in pH,” says Hill. During the night, respiration slows and pH rebounds. The deep sea environment — cold, lightless, nutrient-poor — is very different from nearshore waters and estuaries; conditions are stable, life processes slow. Yet acidification is a concern there as well. Early research by Jim Barry of the Monterey Bay Aquarium Research Institute (MBARI) showed that pumping CO2 down to the seafloor, touted as a carbon-sequestration method, killed tiny creatures that live in seafloor sediment. Larger surface-dwelling animals appeared less sensitive. Launching the ROV Ventana on board the research vessel Point Lobos. Launching and recovering a 2-ton, 10-foot long ROV (remotely operated vehicle) is a tricky business in the open waters of Monterey Bay. After literally thousands of dives, the crew is well-practiced at handling the ROV cable (which contains wires and optical fibre) so that it does not stretch or kink. Barry’s subsequent studies showed more subtle metabolic effects of “normal” CO2 absorption over time. Working with deep ocean species poses a major challenge; you can’t just collect a few species from a tidepool. 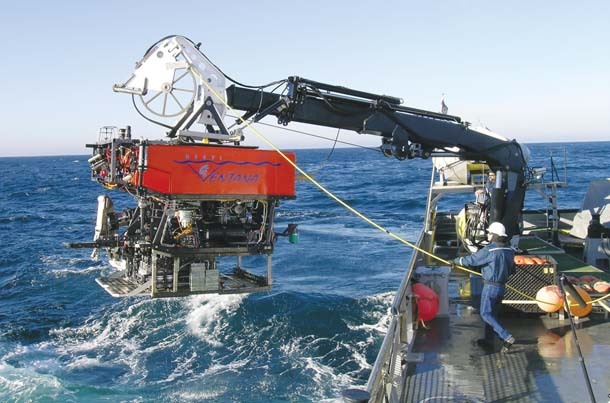 Fortunately Barry has access to MBARI’s remotely operated submersible vehicle (ROV) and to nearby Monterey Submarine Canyon, with depths approaching 4,000 meters. 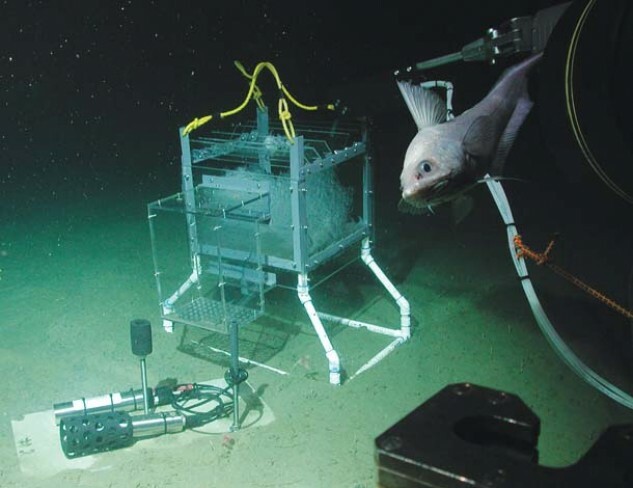 Using the ROV’s ability to transport equipment to the seafloor and a lab-based researcher’s ability to remotely guide the vehicle’s “arms” and “eyes,” Barry was able to test the impact of elevated CO2 on bottom-dwelling species. “We flew the ROV down into the canyon and caught animals with a ‘slurp gun,’” he recalls. Some were brought back to the lab, where deepwater living conditions at depth were simulated; others were placed in test chambers on the seafloor. In both settings, Barry measured baseline metabolic rates, then ramped up CO2levels and monitored the effects. “Things we care about” might include salmon, some species of which feed on pteropods, pelagic snails whose shells may actually dissolve at projected levels of acidity in the North Pacific. What happens if the pteropods crash? Or consider bryozoans, small filter-feeding colonial animals that encrust pilings and kelp fronds; they also have calcium-carbonate shells. “They’re important in kelp forests,” explains Bodega Lab postdoctoral researcher Dan Sweezy. “If too abundant, they can have a negative effect on the kelp.” But they’re prey for sea slugs and other kelp-dwelling invertebrates, and their loss would have consequences. Even if some creatures have the potential to adapt, time is against them. Sea life has survived previous acidification episodes, just barely — 96 percent of all marine species were wiped out in the end-Permian extinction, 252 million years ago. The speed of present-day change is unprecedented, faster than the last major buildup of atmospheric CO2 during the Paleocene-Eocene Thermal Maximum 55 million years ago. Even if we manage to curb greenhouse gas emissions, the acidification trend, like sea level rise, is already locked in — and no one has come up with a plausible technological fix. In California, they’re targeting a strategic audience. Building on pioneering efforts in Washington State, where former governor Christine Gregoire appointed a blue-ribbon panel, the nonprofit California Ocean Science Trust has convened an advisory group with a dual focus on ocean acidification and low oxygen, another growing concern. Tessa Hill is a member. Trust executive director Skyli McAfee says the panel will look at cumulative impacts, adaptive potential of species and ecosystems, and options for local mitigation. “We want to respond to the information needs of policy-makers and resource managers,” she adds, promising “exciting developments.” It’s an encouraging — and necessary — start. Joe Eaton is a land-based writer, although he has been curious about sea creatures since early summers in the Georgia Sea Islands and on the Florida Gulf Coast. His writing currently appears in the San Francisco Chronicle and Estuary News.